If you live in California, you're invited to take the Play Your Part pledge to help achieve these goals. If you don't live in California, you can still take the pledge and participate in sustainability as you watch the big game! Nachos anyone? 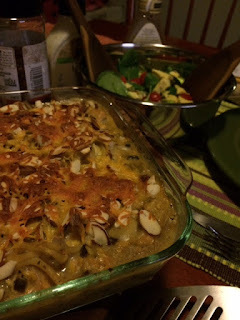 A great winter casserole! This tetrazzini (adapted from a recipe in the January 2009 issue of Southern Living) substitutes white wine and green chiles for the more traditional sherry and mushrooms. While the pasta is cooking, stir together chick'n, cheddar cheese, mushroom soup, Alfredo sauce, chiles, vegetable broth, wine, and pepper. Stir in the pasta. Spoon chick'n and pasta mixture into an 11x8'' pan (lightly greased). Top with almonds and cheddar cheese. Cook for about 35 minutes, or until filling is bubbly and top is golden brown. Let's take a look at celebrities who have taken on green causes! Saving orangutan habitat in Sumatra. Have you removed conflict palm oil from your kitchen shelves? Defending Ivindo National Park. Remember to avoid any elephant products when buying souvenirs, home decor, or medicine. Restoring Ecuador's Pacific Lowland Forests. Learn more about frogs and other amphibians and the environmental threats they face. Recovery of Stellar Sea Lions. Learn more about marine mammals! Let's join Leo and work on species conservation and biodiversity issues! When you're finished watching him tell Ellen Degeneres about sharks, you can plan your conservation strategy. Do you "believe" in climate change? As we dig out from the blizzard, maybe you'll want to watch some videos in your free time. I recently came across climate scientist, Katharine Hayhoe, who speaks on the topic of climate change and how Christianity should address this challenge. Here's one of her presentations. She does a great job of explaining why we don't "believe" in climate change; we simply understand the science and look for solutions. Perfect winter meat-free Friday dinner! 10 fun polar bear facts! Be sure to “Like” greenmomster on facebook for all the latest posts! Here’s your meat-free Friday recipe on Saturday morning! No worries – this recipe is great for weekends too. It’s adapted from Lighten up, y’all: Classic Southern Recipes made Healthy and Wholesome, by Virginia Willis. Preheat the oven to 350 degrees F and grease an 9x13 pan with cooking spray. While the grits are cooking, heat the oil in a large pot. Add onion, celery, and carrot and cook until starting to soften. Add garlic and saute for about 1 minute. Add the chick’n tenders and cook for about 5 minutes. Add the red pepper flakes, cinnamon, and nutmeg. Pour in wine and add spinach. Cover the pot and simmer until the spinach starts to wilt. Add oregaano. Add the parmesan cheese to the grits and stir well. Pour the chick’n/vegetable mixture into the pan and spread across the bottom of the pan. Top with the grits, spreading the grits evenly with a wet rubber spatula, and cook until the grits are set and golden brown, about 30 – 40 minutes. I like that the President dismissed climate change denial, and connected a clean energy future with a strong economy. Here’s a link to the entire speech. Here’s a crowd-pleaser I adapted from Lighten up, Y’all, Classic Southern Recipes made Healthy and Wholesome by Virginia Willis. I played with the amounts of various ingredients and found the recipe to be very forgiving. To prepare tomatoes, slice off the tops, remove the cores, and hollow out the shells. Keep the pulp and squeeze with your hands or a spoon. To make the filling: Heat the oil in a skillet and add corn, poblano pepper, and salt and pepper. Cook until the corn is tender. Add the tomato pulp and cook for about 5 minutes. Add the cheese and thyme. Arrange the tomato shells in a casserole dish and fill with the filling. Sprinkle with breadcrumbs. Bake for about 25 minutes or until the topping is golden and tomatoes are tender. Be careful when serving – the tomatoes get pretty soft! Go for a hike at least one time per month to unwind and enjoy nature! Use only reuseable bags at the grocery store. Friends don’t let friends use plastic. Resolve to watch 4 documentaries on environmental topics this year. Some of greenmomster’s favorites include: Turtle, the Incredible Journey; Merchants of Doubt; YERT: Your Environmental Road Trip; Ingredients. Choose one environmental issue – elephant poaching, climate change, fracking, clean water, the illegal trade in tiger or reptile parts, the Keystone XL pipeline, mountaintop removal, local agriculture, another local issue – and resolve to get involved. Research the topic and, at least twice during 2016, write to your elected officials to share your opinion. Read at least two books on environmental topics. If you read Silent Spring by Rachel Carson, or The Forest Unseen by David George Haskell as greenmomster suggested last year, try Love, Life, and Elephants by Dame Daphne Sheldrick or Red-Tails in Love by Marie Winn this year. You could even read Dr. Seuss’ The Lorax, if you like shorter reads! Reduce your use of plastics – start by “just saying no” to plastic straws. Here’s an interesting article on the topic from HuffPost. Be sure to use your baggie dryer, and don’t forget to avoiding products with unnecessary packaging – do your bananas really need to be in a plastic baggie? Vote green! Don’t miss any elections in 2016! Get out of your comfort zone! Choose one environmental action that’s going to take a bit of work and make it your goal for 2016. What’s your 2016 green resolution? Please share!